AML Compliance does not have to be so costly and disruptive for emerging payments innovators and the small enterprise. See if we cover your specific lists in our global watchlist database with 900+ lists and growing! Test our SmartScan™ Sanction Screening service. Search a Name, Entity, ID, Address, or DOB. Know what lists to screen based on your Risk Profile. Stop Over-Screening. Speed up Customer Onboarding. No Risk Assessment? No Problem. Use the FREE tool to write, manage, and track your Risk-based AML Policy. Our team of CAMS™ certified AML specialists have combined next-generation technology with our deep understanding of MSBs, ICOs, and Cryptocurrency operations to deliver compliant AML solutions that are low friction and cost effective. In the past, AML compliance was limited to banks. Today, any business that handles money or financial assets must in the very least screen against global sanction lists to be compliant and avoid penalties. This includes small enterprises such as PSPs, MSBs, FX Brokers, Investment Managers, Art Dealers, Real Estate Brokers, Travel Agents, Casinos, Charitable NGOs, Online Merchants, Virtual Currency Exchanges, ICOs, and MORE! If so, are you using the proper risk-based approach to avoid over-screening? Use our free AML risk assessment tool to find out and create your risk profile. Manually clearing false positives and managing documentation can be costly. DecisionIQ takes a risk-based approach to deliver actionable screening decisions that are compliant, fast, and affordable. We help you speed up customer onboarding and get back to business. AML compliance begins with a risk assessment and then defining mitigating controls as part of your overall risk-based approach. For most small businesses, this is the first step towards cost, confusion, and frustration. It does not have to be! Use our FREE Risk Assessment Tool to generate your risk assessment report. Did you know that 80% of costs of AML compliance are from manual activities? Stop paying for compliance roles that our Vskills™ certified AML officers in India can do better, faster, and at less than half the cost. Need a part-time CAMLO or help creating your AML compliance regime from scratch? Let our AML professionals help you. We have experience working with Payment Services Providers, Money Service Businesses, Virtual Currency Exchanges, ICOs, Universities, and Charities. Contact Us to learn more about AML compliance regimes. We are searching over 900+ global list Please be patient, as this may take a few moments. This is a LIMITED search. Click here to SIGN UP for free 30 days UNLIMITED ACCESS. "Thanks for the pay-as-you-go option; it meets our needs very well"
"Good news, after trying the demo, our staff loves the system!" "Wowzers. My bank gave me a list of 6 lists and said 'check those that apply'. I need more check boxes!" "DecisionIQ and KYC2020's team of AML specialists made it very easy for us to get started hands-free!" "We are thrilled to add KYC2020 to our compliance curriculum!" "KYC2020 is a leader in delivering a comprehensive and continuously expanding global watch lists"
database, along with the most flexible and convenient way to access and screen against this data. Is it time to move from traditional screening tools to hands-free decision services? Learn how DecisionIQ combines intelligent system design with affordable outsourcing to deliver a real-time and 100% ‘hands-free’ sanction screening service to speed up your customer onboarding and recurring review. Canadian MSB wanted to lower screening costs. The new solution had to fit in with existing workflow. KYC2020 SmartScan Batch Interface was easy to implement, and reduced costs from $ 0.65 to under $0.02 per search! An online payment innovator needed to meet FINTRAC compliance for customer onboarding. The solution had to fit their start-up budget, with ability to scale. 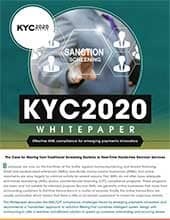 KYC2020 Pay-as-you-go option was easy to get started. Major currency exchange needed to lower screening costs. Solution had to be automated and handle 1MM+ searches per month. KYC2020 developed an API interface for fast processing and delivered a 10-fold reduction in cost! Our first whitepaper in 2016 identifies data providers as the reason for high cost of sanction screening solutions. KYC2020 begins developing its own global watchlist database to provide affordable solutions MSBs and emerging FinTech. Is it time to move from Screening Tools to Decision Services? Small and Mid-size Enterprises, from MSBs to charities are now on the frontlines of the battle against money laundering and terrorist financing. This whitepaper presents the challenges with existing solutions and recommends a path for SMEs to real-time, hands-free, frictionless compliance! 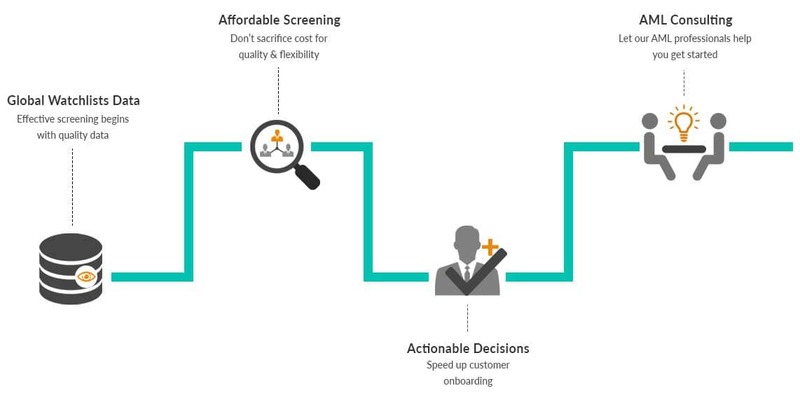 How to make your Customer Onboarding process real-time, hands-free… and compliant! The Risk Assessment Tool is currently under beta testing. Please click here to leave your details so that we can notify you once it is in general release. KYC2020 is your single source for comprehensive Global Politically Exposed Persons (PEP), Criminal, Sanction, and Terrorist lists for Know Your Customer (KYC) & Anti-Money Laundering (AML) compliance regimes. © 2019 KYC2020 LLC. All rights reserved.